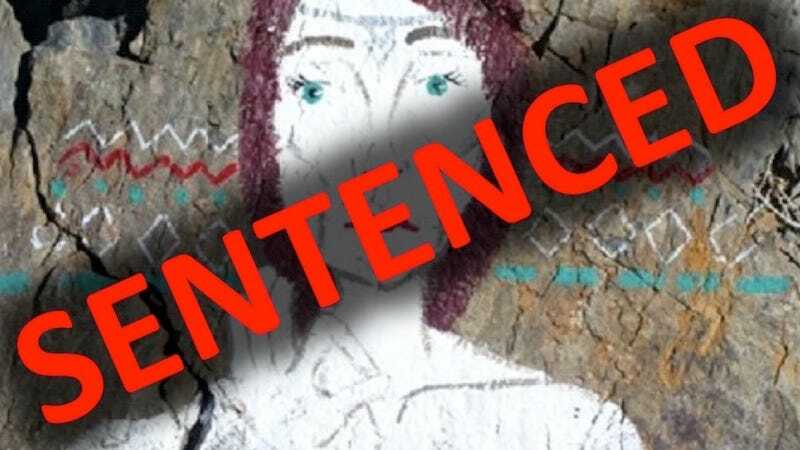 A San Diego woman named Casey Nocket built a name for herself under the Instagram handle “Creepytings” for her acrylic paintings scrawled on ancient land under federal protection. Nocket first came to wide public attention on the site Modern Hiker, but internet parks lovers everywhere were so infuriated by Nocket’s drawings that she became a popular subject on Reddit. 1 - Thanks to all who have reached out to me, I appreciate your concern and your efforts. 2 - Please remember, EVERYONE in our society has the right to Due Process. 3 - Please don’t try to fix this type of vandalism yourself, either in this case or others. Let us handle this/contact the local authorities in other cases. We don’t want to make things worse. 4 - Due Process, Due Process, Due Process. Due process has come through. Nocket pled guilty last week to seven misdemeanor counts of defiling rock formations in seven national parks. Judge Sheila K. Oberto sentenced her to 200 hours of community service, and a hearing about financial restitution has been scheduled for a later date. Nocket has also been banned from 524 million acres of public lands for a two year probationary period. The price you pay for your Art.